Non-contact radar level transmitter installed in process tank. Radar is a means by which electromagnetic waves of short wavelength (microwaves) are used to detect the presence, distance and location of a remotely located object. While well known for its use in miltary and air traffic control applications, radar ranging technology is used in industrial processing to measure liquid and solids levels in containers of many types. Condensed to a simple explanation, a radar level measurement instrument emits timed electromagnetic energy bursts, measuring the time interval from each burst emission to return. The emitter directs the microwaves toward the surface of the material to be measured. As the distance from the emitter to the material surface increases, so does the transit time of the wave on its round trip from emitter to media surface and back to a detector antenna. This transit time is proportional to the distance from the emitter to the media surface and can be used to calculate the media level. 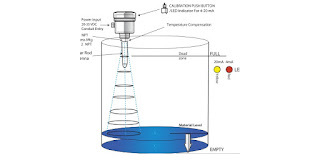 Radar level transmitters can provide onboard processing of the raw signal, delivering a standard industrial process control signal which is scaled to a useful value range indicating percentage of tank fill, or some other useful representation of media level. It is necessary for the surface of the material to be measured to have properties which will reflect a sufficient amount of the radiation to allow a detection of the return signal. This is not problematical for most materials, but each application should be discussed with an instrumentation specialist to confirm suitability. Radar level technology is utilized in a guided wave format, where the emitted energy travels down a tube extending into the medium, and non-contact configurations with the microwave emissions dispersing as they travel from the source antenna. Both types deliver excellent accuracy and have their specific application criteria where they may be preferred. 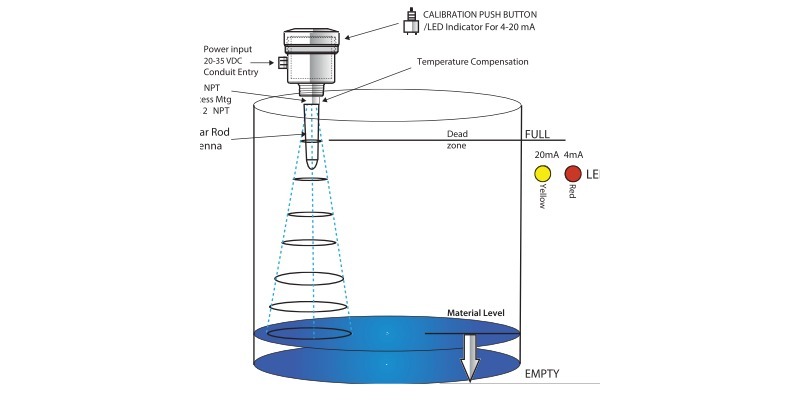 Properly selecting and applying level measurement instrumentation requires consideration of many operational and technological aspects of each process. Share your process measurement challenges with application specialists and leverage your own knowledge and experience with their product application expertise. Radar Non-Contact Level Transmitter from Hile Controls of Alabama, Inc.